With only a handful of games being played on Easter weekend, we’ve got some interesting developments, coming your way. In the glorious Welsh sun, the Hurricanes, Stampede, Thunderducks & Falcons met in Mountain Ash, yes it was on flat ground, not a mountain. Exeter started the day early, but unfortunately left the day empty handed after being offensively shutout by a stubborn Stampede defence. In short afterwards, everyone beat everyone. In long… the Thunderducks beat the Stampede, who beat the Hurricanes, who beat the Thunderducks. Yeah. The vocal Stampede’s impressive JJ Spencer, led the way for them offensively showing how important he was to making the yards after the catch. But the execution and play calling the Stampede’s coach had the offence clicking, at was very easy on the eye. The Thunderducks managed to scrape out a tough fought for victory against the Stampede despite a depleted squad and a player having to leave halfway through the game. The leadership of the Thomas brothers is ever-growing, especially with a crop of youngsters coming through! That and a victory over the Falcons atoned for them unfortunately being able to field a team on gameday one, in Exeter, putting them at 2-2, until they played the Hurricanes. The Hurricanes started strong with a large victory over the then depleted Thunderducks, thanks to some ‘dimes’ by QB Matt Thomas. However, the Stampede managed to minimise those in the second game, and coming out with the victory after a failed 2 pointer. That win does open ajar the race for the SWC South division, so keep an eye out for how both fair next time out when the Cardiff Hurricanes host an SWC inter-conference gameday on the 22nd of April and the Stampede travel over to the Coventry Panthers, who host them on the same day. Wigan recently came under fire for an ejection a few weeks ago. Whilst that is all in the past, three key players, both Marc & Dino Vernazza, plus Danny Caballero, have all left the team, with Danny rumored to be joining the Coventry Cougars (Mixed not Ladies) and Dino and his brother possibly joining the newly formed Warrington Revolution. We hope both Wigan and the players can get back to enjoying flag quickly! The experience of the Chichester Sharks should never be counted out, even if it is 20-0 at half-time. Yup, you guessed it. QB Neil Henderson and his offence are a force when they are all executing properly, and boy did the Knights feel it, eventually falling to a close 34-32 loss. Chichester then went on to best the Solent Thrashers in a 38-27 victory over the Andover based outfit. 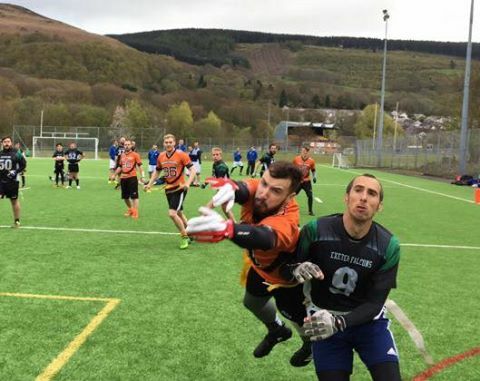 With the Reading Lions unable to field a team on, lets face it a strange date to schedule fixtures in, Easter Sunday, we have not heard of any official statement to say whether the games will be forfeited or rescheduled as of yet. We will endeavour to let you know as soon as we hear. As part of our build up to the weekends action, we teased you with a the SEC North match-up between the West Essex Showboats and the Aylesbury Vale Spartans. Turns out we were right. The game was a classic. Both quarterbacks, Nick Bertenshaw and Harry Staszewski were on form. Nick firing off two touchdowns in the first half to his receivers and Harry matching them with finding Jeff Bond for two scores. In the second half, the Showboats took advantage of the Spartans inability to get the extra points in the first half, now leading 28-19. That left the Spartans needing two scores, with under a minute left. They managed to get a touchdown and covert a two pointer. But it ultimately left them a point short, losing 28-27. The Showboats and the Spartans both then dispatched the Bedford Blackhawks and Ware Wolves, leaving the Showboats on 3-0 and Spartans 2-1 for the day. This weekend at least 5 games could’ve or were decided by extra points. The extra point has forever been a very important part of the game, with teams spending hours in training and on the whiteboard trying to get those certain plays down for a 100% success rate. Which begs the question, do you practice or have those plays in your playbook(s) for your team?